And maybe those are really the same thing! 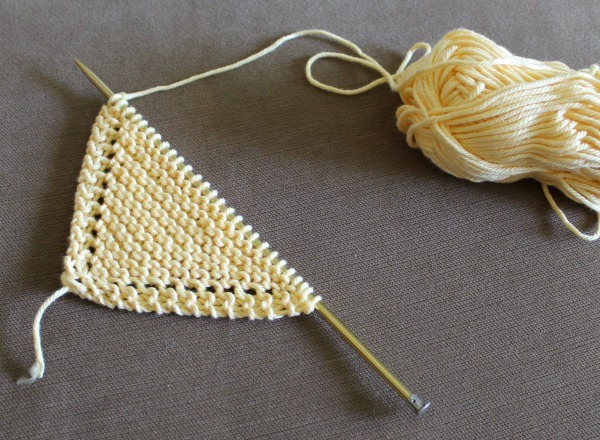 Because almost any project that uses garter stitch (where you knit every row – no purling!) usually turns out to be a project that moves along very quickly. Several years ago I wrote about my dishcloth pattern as being one of my favorites but since that time I’ve kept tweaking and trying some different things and now I have a NEW favorite (a No Holes version!) and updated corners and have put them all together in one printable pattern. But first a quick note – – no more #10 needles for my dishcloths. I made them that way many times, but have now decided I like them knit a little tighter. Any dishcloth I knit now I do on #7 needles. OK, on to the updates! This is my new favorite knit dishcloth pattern, and it’s easy to do! The classic pattern for diagonal knit dishcloths uses a yarn over that creates holes along the edge. This is also how you keep increasing as you knit diagonally. But with a little tweak you can still increase and not have the holes. How? By using a reverse yarn-over. Instead of wrapping the yarn from the back to the front as you would normally do, you wrap the yarn from the front to the back. This might feel a little strange at first but as you knit along you’ll easily get used to it. This reverse yarn over let’s you keep increasing as you knit, but without creating a hole. I found this to be a nice change that created a sturdy dishcloth. The second tweak you’ll find in my No Holes Dishcloth pattern is on the corners. I’ve slightly changed how I increase at the very beginning, and also how I bind off at the end. But the more interesting thing is the use of a short row in the middle to make sharper corners. This seemed to give the corners just a bit more definition and it’s a change I now incorporate into all my knit dishcloths. I did my best to make a quick little video showing both the reverse yarn over, and the short rows for the corners. 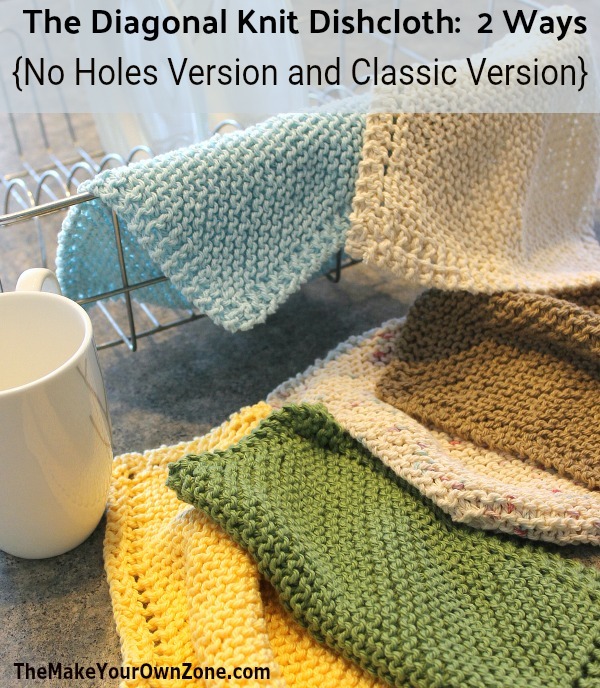 Even though I’m loving my No Holes version of the knit dishcloths, I still like to make the traditional “Holes” version from time to time too. The updates to this pattern are that I’ve switched to using #7 needles, and I’ve also incorporated my changes to the corners. BUT, I found that I only liked to use the short row method on one side of the Holes dishcloth. So the short row is incorporated in this pattern too, but in a slightly different way. 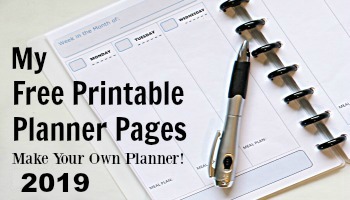 All 3 Options In One Printable Pattern! Can’t decide which version to make? 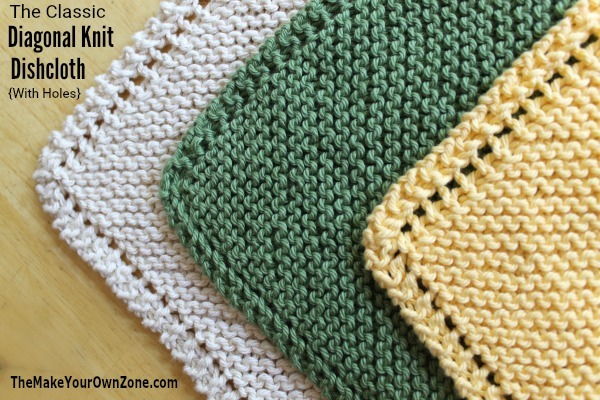 I’ve put all three of my garter stitch dishcloths together in one printable pattern! Option #1 – The tried and true original (no reverse yarn overs or short rows to confuse beginners). This is the classic version with holes along the edge. 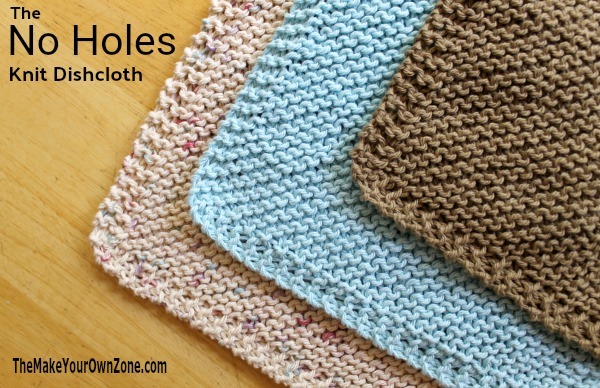 Option #2 – The classic “holes along the edges dishcloth”, but with updated instructions for more defined corners. Option #3 – The No Holes diagonal dishcloth. A fun twist on the pattern that uses a reverse yarn-over and the updated corner instructions. And of course you are free to mix and match! For instance you can use the simple corners from Option 1, but work the body of the dishcloth with the Option 3 No Holes method. Finally, knit dishcloths should be made with 100% cotton yarn. The Sugar ‘n Cream brand is always a good choice and comes in lots of nice color options. Thanks so much….I’ve been making these for years….was never a fan of the holes….perfect! The one question I have…..when I knit continental, it still gets the holes…any thoughts on that? I’ve tried the YO in front and behind the needles, but still seem to get a hole…..so I’ve switched to “throwing” the yarn for this pattern–any thoughts on why continental wouldn’t work the same? Thanks! Well you have me puzzled on this yarn over question too! I watched some YouTube videos about yarn-overs and continental knitting, and the best I can come up with is that because the yarn is coming from the left hand, it must change things somehow. I’ve never done knitting continental style (although it looks like a faster way to knit) so unfortunately I don’t have a good answer for you on this one. Thanks so much for the reply and research….I’m on my 3rd dish cloth…..love these—-and love having little projects…thanks again! My Mother made 30 of these dishcloths for me over 25 years ago. They are all that I use in the kitchen. I love them. After all these years they are finally starting to wear out. I have been looking for the pattern and this is it! I don’t know anything about knitting, so wish me luck. Yes, these diagonal knit dishcloths are oldies but goodies. They are pretty simple to make so even if you are an inexperienced knitter I think you should be able to do it. Thank you, thank you! I’ve been looking for a no-holes diagonal pattern. I have made the diagonal dishcloths before and love how quickly they come together so I thought it’d be a great way to make a baby blanket. The problem is the holes, of course. I wouldn’t want little toes to get stuck in the holes so a no-holes version would be perfect! Do you have any tips on needle size/type of yarn/amount of yarn to make baby blankets using your pattern? Yes, this pattern could definitely be adapted to a baby afghan! If you use regular worsted yarn (4 weight) I would suggest size 9 needles and probably about three 4 oz skeins of yarn. You would want to knit it about 40″ square. Good luck! Thank you so much! I’ve been looking for easy patterns to knit while i wait with my daighter for her doctors appointment! 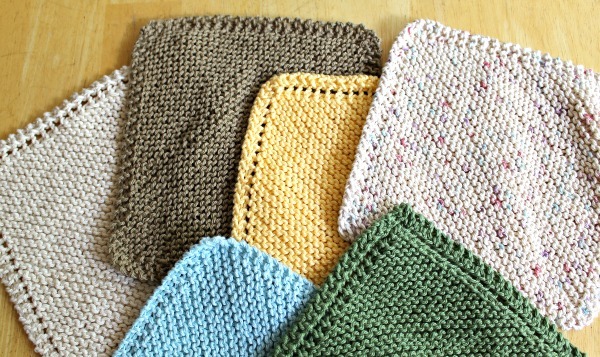 These dishcloths are a great “while you wait” type of knitting project Sheila. They are small and easy to take with you. I hope you enjoy the pattern!